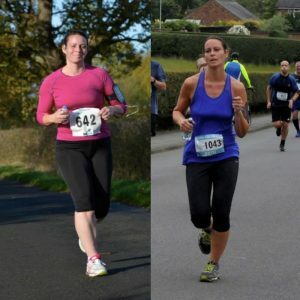 “I started on journey about 3 years ago, like many other women I had that moment where I looked in the mirror daily and disliked the image looking back at me. I’d been in denial about the weight after having my second child – thinking of its just another lb or 2 I’ll shake that off soon enough – but before I knew it I was at my heaviest ever outside of being pregnant, 14 st 10, I had IBS symptoms and was on almost daily medications, I was lethargic and miserable. I started making small changes; going for a run/go the gym, cutting out bread, dairy, eating more salad and veg, I lost some of the weight but it never seem sustainable. 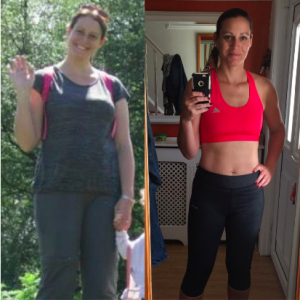 Then I found Natasha’s Transform25 plan and thought it was worth a try, I’d realised by now I wasn’t just intolerant to dairy but I wasn’t 100% sure it was gluten too. The first detox was tough but I knew there was a purpose, I’d made my commitment to myself and the group who were also trying this for the first time. After the 4 days I was amazed I’d lost 8lb. I was worried I would put it all on when eating but found that at the end of the first week I’d lost more. I managed to fit exercise into my daily routine easily doing a HIIT session at 6 am before the kids were awake. As time went on the weight was dropping off me more and more, but I was getting more than that. I was starting to get a bit of me back too, my spark was starting to return. I’d known for some time things weren’t good at home, I’d started to lose my identity after years of living in a difficult relationship. Getting back a bit of me through starting to like what I saw and how I felt made me realise I deserved more. I eventually made the difficult decision to leave this relationship. Not long after doing this and moving out Natasha ran her first self-love challenge, the timing was perfect for me so I jumped on the chance to take part. The daily tasks for the month made me realise how low my self worth had gone. It made me face a lot of demons and over the course of the month I slowly broke down the negativity I aimed towards myself. I started receiving compliments not for the way I looked physically but for how happy I looked, family shared how much nicer as a person they thought I was now, I noticed friendships getting better as I dropped the hard-faced persona. 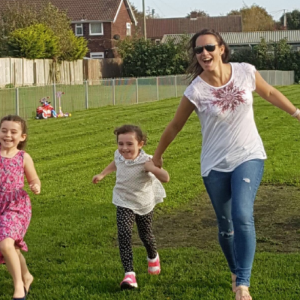 My outlook on life was more positive, I was genuinely happy, more relaxed, free…… the icing on the cake was seeing this reflected in my children, they were happy, relaxed, more confident and much less clingy, the adage is true – Happy mum, Happy kids. Where am I now? I am the fittest I have ever been, I have lost 3.5st (49lbs), gone from a size 16-18 to a 10-12 and kept it off for nearly 3 years. I have accepted my body shape and learnt how to dress for it. I am grateful for my body and what it can do – 8 half marathons, tough mudder, 10K’s. I genuinely like the person who looks back at me every day. I have stepped out of my comfort zone and presented at work conferences, applied for a new job I’d talked myself out of a thousand times before – I got it too! I have amazing friends around me that I am grateful for and have inspired some of them to do the same and this makes me feel humbled to watch their transformations too. But most of all I am Happy, the Transform25 and big focus on learning to love myself has made all the difference to this transformation being a new way of life and not just another fad diet. Beth your story is absolutely incredible and I have loved seeing you blossom over the last 3 years and leading such a happier life now. You are an inspiration to many, especially your young daughters. You deserve all the happiness in the world. If you are ready to start your own health journey where you will lose weight with ease and learn to love yourself again, my Transform25 programme will definitely help you achieve your goals and more! It’s a 25 day programme that gets rapid results (eating more food than ever before!). You get lifetime access and most women continue after the 25 days as a way of life. It will teach you how to lose weight without counting calories, achieve your best health and the all important mindset change: learning to love yourself.